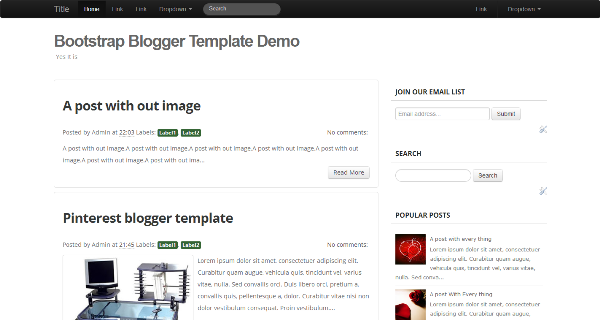 Today we are releasing a simple blogger template developed using twitter bootstrap. We are making use of responsive design features twitter bootstrap to give consistent user experience in most of the devices without enabling mobile layout for blogger blogs. Maximum width for this template is 1200px. It is a fully responsive template, which is having greatest width of 1200 px and it will consistent user experience in any device. If you need to confirm responsiveness of this template use follow this link or use responsive design testing tool. Looking for Bootstrap WordPress Themes ? Editing menu elements is very simple. What you need is simple knowledge about HTML links. Open template in a text editor or use blogger editor to replace dummy # links with your own links and anchor texts. Replace skyafar with your own feedburner name. Then it will give a subsciption box similar to demo. For more elements please visit Twitter Bootstrap. For few days this blogger template is not free. Which doesn’t mean that you have to pay for this template. But you have to tweet about this template to download the same. Try our new Flat Design Twitter Bootstrap Blogger Template. its nice to see that well designed template but how do i add blog posts to a bootstrap template if there is no interface like WordPress? Do i add it all manually? Actually it is a blogger template built using bootstrap. So you can only use it in a blogger blog (blogspot blog). I want to try and center the links on the top navigation bar (“home, link, link”). How can I do that? I’ve tried adding in text-align=”center” and a few other things, but maybe I am not doing it under the correct properties. My second question is that I want to get rid of the overview of posts block that happens above the actual posts (the part where it shows a snippet of the post and then you click “read more”). I just want it to display full posts right away. How can I get rid of that block? And last question – how do I get rid of the jump breaks? I have a sample post that has 3 large images (one after another scrolling down) that I am running off of and I did not put any jump breaks into the post, but the template is automatically cutting it into a jump break after the first image. How to I make it so that you can see all three large images without having to click “read more”? 1st question : I think doing like this will work for you, giving width along with margin. share your blog, so i can check more. A couple of weeks ago I sent an email, but I haven’t gotten a response so far. So I will post my question here again: How do I use this template? All I got in the zipfile was a xml file. Where are the separate html & css files? Where do you need to use this template? It is a blogger template.